Sometimes the modern world will make you so nuts that even your “Frankie Says Chillax” Spotify playlist can’t calm you down. The solution? Flee to the calm waters of the past. The historical tourism industry makes it easy to drink like a colonist or run with the raptors—so dissolve your present tension with a long weekend of nostalgia for something you never saw. 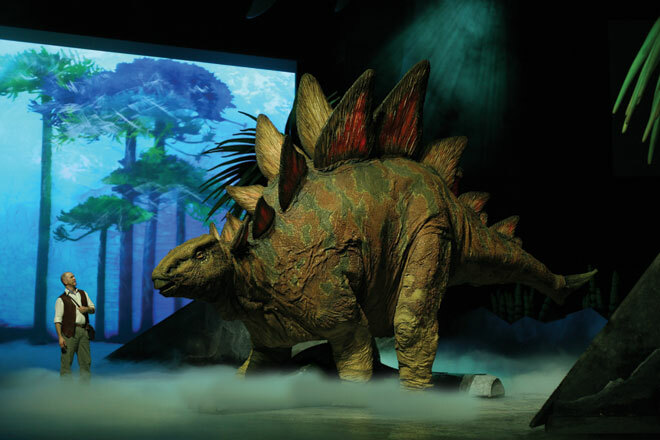 Until that guy from the previous Wired issue finally makes a dinosaur from a chicken, this animatronic “arena spectacular” will have to suffice: Life-size replicas of various Mesozoic-era beasties (including a 39-foot-long allosaurus) stomp prehistorically across a giant stage. Triassic, you’ll like it! Sure, Victorian England is (de)famed for cholera outbreaks and gruel-grubbing urchins, but it also gave us Charles Dickens. Bookish travelers and consumption fans can visit this literary complex to see a show of animatronic Dickens characters, walk through a replica prison cell, or simply try to figure out what a farthing is. Colonial America was drunk on the heady rush of patriotism, and today’s tipplers can pursue their own heady rush by slamming ale in one of Paul Revere’s haunts (the landmark was built in 1773). The chef re-creates colonial dishes like braised rabbit and West Indian pepperpot soup, but tread lightly: Tums won’t be invented until 1928. The world was so much simpler in Old Testament days. The apples were pesticide-free, and no one thought twice before setting a baby adrift among the rushes. When this living-history theme park opens in 2014, lo-fi types can go native to experience a full-size ark, a Tower of Babel, and lines of biblical proportion.